The high desert landscapes of Santa Fe, New Mexico, and Joshua Tree, California are unique, almost other-worldly environments. These places have a mysterious, spiritual quality that always seems to enchant and call us inward. 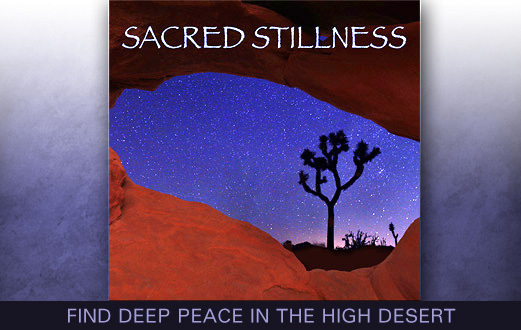 In Sacred Stillness, you’ll visit the high desert, and experience its mystery.You’ll walk a well traveled path to a hilltop, where your campfire is waiting. There you’ll make an inner connection with a raven, become entranced by his sound, and see the world through his eyes. You’ll have an opportunity to pose any question, and find the answer within. Connecting with deep inner peace, you’ll also project that feeling forward to your future self, to move through your next challenges with ease. "As you continue to focus on the raven’s voice you find yourself looking out from his eyes, observing life from his perspective. You can see yourself sitting by the fire, the rocky area around you, and the surrounding landscape stretching out for miles into the distance. A river bisects the land, reflecting the last light overhead. And in the sky above, the first stars are just beginning to appear..."